So, my mom just told me that she wants a Wii game for Christmas. All she has at the moment are Wii Sports and Wii Fit. 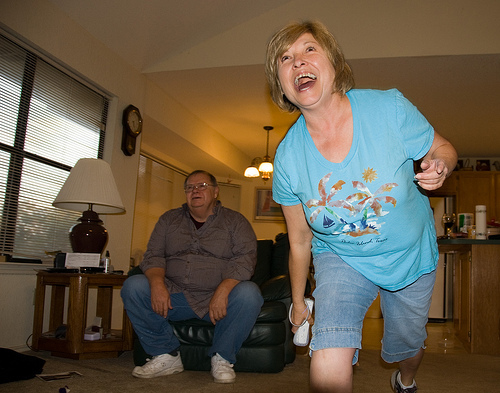 As far as I can tell, she likes both games, so she'd probably enjoy Wii Sports Resort--or one of the Wii Fit clones. Have any of you had any experience with The Biggest Loser, EA Sports Active or Your Shape and, if so, would you recommend them to an aging lady who enjoys a bit of exercise? Note: The people in the photo above aren't my dad or my mom. Two other possibilities, in my mind, are Just Dance or Just Dance 2, since my mom loves to shake her tail feather. Have any of you played and enjoyed either of those titles? Finally, she likes puzzle games. She loved Tetris DS more than life itself, so Tetris Party Deluxe is a definite option--if it's any good. Sadly, I have no experience with any of those titles--exceo\pt Wii Sports Resort, which is SO FUN! That's OK, Justin! Can you think of any other games you've played that an aging woman who likes Tetris, Wii Fit and Wii Sports might like? I don't have a Wii, but I do have a Mom. So based solely on my knowledge of moms, I'll say that she'll probably love any game that comes from her son. Of course you're right, Sean. Still, I want to get her a game she'll really enjoy. I'm really thinking either Just Dance 2 or Tetris Party Deluxe is the way to go, though Boom Blox is a possibility, too. While she and my dad are here over Christmas, I'll have her play a bunch of the games that I *think* she may enjoy, like Wii Sports Resort, New SMB Wii ... and whatever games I don't get her from the above list. Anyway, enough about me. Yes, I think you should get your mom a Wii -- if you think she'd play it. Or a DS. My mom LOVES her DS. Hm...a lot of my non-gaming friends love Boom Blox. That's a pretty good idea! Maybe Kororinpa?